WigsBuy is using stolen photos to advertise knock-off wigs! 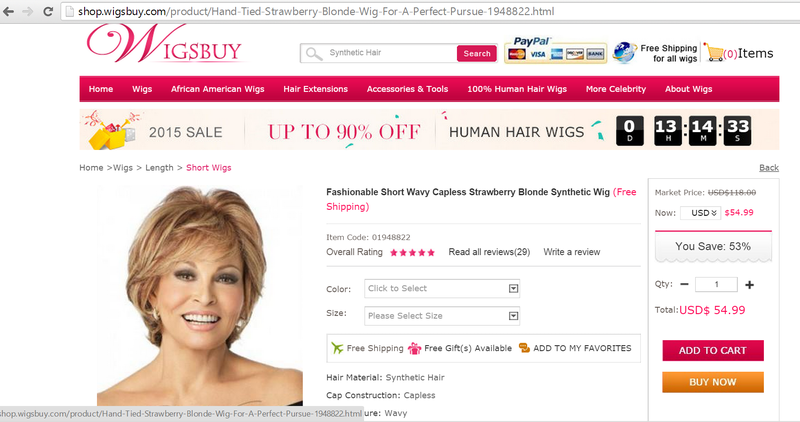 WigsBuy.com is using stolen celebrity & name brand product images to advertise knock-off wigs! Find out what Rene D. (a former wigsbuy customer) has to say! Looking for an authorized Raquel Welch Wigs retailer, click here. When you try to write a review on the site if it does not have a certain amount of stars it will erase. There is nothing like she said, the construction of the whole thing was terrible. The amount of lace was not as she said shipping took forever as if she was specially making it. Never again $171.00 with shipping and it was horrible. Sale prices are fake they up the price and say 90% discount and the hair is not close to being worth that price. Wigsbuy is a fraud! I recently ordered a wig from wigsbuy but the cap was too small and didn’t fit my head. I sent an email asking for an exchange for the next size. I received an email from Wigsbuy asking I take pictures of the wig. Not sure why they requested that but I did take pictures and sent them. I received their next email stating the wigs are custom made and they could not exchange it and recommended I go to a hairdresser to see if they can help. First of all the wig was not custom made for me. Obviously their response was unacceptable to me. The wig was over $200. Their website states they want their customers to be happy but that is a lie. They are very difficult to work with. I sent them an email stating I want to return the wig and get a full refund and am waiting for their response. I have also contacted my credit card company to make them aware of the situation. Chinese Wigs Scam – See who’s on the list! Beware of Chinese rip-off sites. Wigs – Scam Alert | Find out what’s going on! False advertising. They use stolen celebrity photos and/or wig photos from legitimate & established manufactures sites to advertise. It is called bait and switch technique. Poor quality products as these wigs are poorly made knockoffs. No resolution or recourse after you have been fooled. “They tell you what a great price you got and how it was made just for your order” but will not allow you to return or exchange. In many customer cases they did not send the product at all. You have no US phone contact or location to resolve your matter in most cases. View Chinese rip-off web site list. To avoid being a victim of fraud when buying wigs online, you may want to checkout who’s trusted & authorized to sell name brand wigs in the US. View authorized retailer list.